These elections, however, have been revolutionary. They represent a turning point that on the one hand illustrates a political impasse as both the winners, Cinque Stelle (Five Stars) and La Lega (the League), are unable to form a government, but on the other hand indicates a very clear change. The Left is dead – support for the PD (Democratic Party), the center-left party led by former Prime Minister Matteo Renzi, has plummeted from 297 seats in the Chamber of Deputies to 107 and from 111 Senate seats to just 45. The Center Right is also suffering, because Silvio Berlusconi, also a former prime minister, did not perform his usual political magic. Neither of the two leaders of the big party winners of the elections has ever worked a 9 to 5 job. They don’t possess any specific skills, academic degrees, or any military or professional experience, except as party activists. The big winner Luigi Di Maio, aged 31, from Avellino, a peripheral town not far from Naples, is a typical son of the south, where his party brought home the largest loot. Some people remember him as an usher at the Naples football stadium. His party, Cinque Stelle, is very anti-establishment, but is deeply different from La Lega, the other winner in these elections. Its anti-the-system attitude is not moderate or right wing, but only aggressively anti-leading class; La Lega is clearly a moderate conservative party, headed by Matteo Salvini, aged 44, who now leads the right-wing coalition, as support for his predecessor Berlusconi has dropped. These two hate each other more than they hate the Left, whose votes have given Five Stars the gift of victory, and who now talks very openly about joining this populist party in its road to the government. There are unique reasons for this double victory: the frustration and unhappiness of the Italians, as well as their rage against Europe, which has abandoned this long Italian geographic “boot” – the bridge for all the immigrants emerging from the Mediterranean Sea. The economic problems of these years, Europe’s nasty attitude toward the wave of immigration that Italy has faced, more than any other state in Europe, the pyramidal structure of the clannish Italian powers, and the resulting corruption have all led to Five Stars emerging with more than 30 percent of the vote, and La Lega with about 19 percent. The moderates are nowadays out of fashion, and the PD is on a sad, never-ending spiral toward total destruction. Italy is now a multi-faceted example of the many aspects of populism, and it shows how wrong it is to blame only the right wing. The Right is only one part of the problem. Until 2013, La Lega was devoted to a dream: the independence of the wealthy north of Italy from the poorer, dependent south. However, under the guidance of Salvini, it developed into a national party. 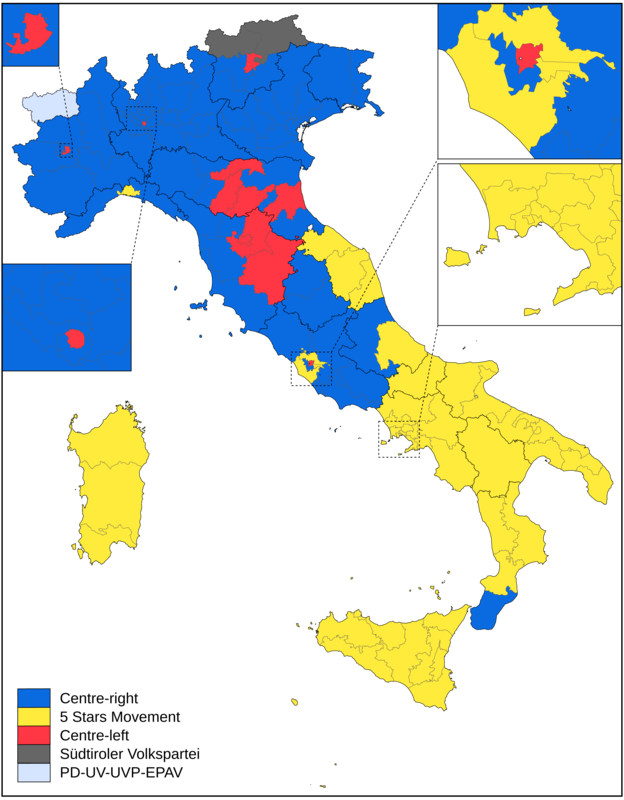 Nevertheless, most of La Lega’s votes still came from the north, while Five Stars got most of its support from the south of Italy. Salvini’s La Lega party has formed a center-right coalition with Silvio Berlusconi’s Forze Italia party and a small, ultraconservative nationalist party called Brothers of Italy. In this way, Berlusconi tries to maintain his role of the “noble father,” moderate and open toward globalization and Europe. But he has lost, while the toughest part of the coalition has gained electoral support. The other loser is the Left, which still favors a stronger Europe, in the style of French President Emmanuel Macron, and prefers to legitimize immigration while still fighting illegal entry. It had hoped for a long life of success under the leadership of the energetic Matteo Renzi, who had previously gained a strong majority after inventing a moderate Left that was free from the memory of Communism. However, both sides were beaten by Five Stars and its utopian dream. Di Maio, who sought to put a stop to excessive privilege and corruption, has demanded a stipendio di cittadinanza, a “citizen salary” from the state for every Italian. He also wants to cancel the Fornero Law, which sets pension age as 67, a typically leftist goal that can set the unstable Italian economy in flames. Five Stars is a sort of utopian despiser of modernity and a free economy. It is against the compulsory vaccination of children, and is actually against any vaccination at all. Five Stars has promoted various kinds of conspiracy theories. Some of the party’s members have written that the mythological Sirens really exist. Others cast serious doubts upon the real story of 9/11. And, no wonder, some Five Stars voters are very keen to believe in the most anti-Israel narrative. For example, when Di Maio recently indicated who he may choose from his party to become ministers, he mentioned the name of Lorenzo Fioramonti, a university professor and BDS activist. Several members of his party have also expressed disapproval and disgust for the State of Israel and appreciation for Iran, where the wife of its founder, Beppe Grillo, was born. While the right-wing coalition has a majority in theory, it still cannot govern because a majority of 40 per cent is needed, which no one has secured. Five Stars cannot form a government, as the Left and Right are both, in its view, too connected with the old power structure, which disgusts Di Maio and Beppe Grillo, the godfather of the party. Italian President Sergio Mattarella must decide who will be appointed to form a government. No one knows what will ultimately happen. It is likely that the present government, led by Prime Minister Paolo Gentiloni of the PD, will continue for a while in a technical capacity, but interestingly enough, it should be noted that Di Maio is speaking intensively with the Left, and not with the other side of the populist surge. Di Maio may have announced his triumph, but Italy has just become the unhappiest country in Europe. A version of this analysis appeared in the Jerusalem Post on March 14, 2018. Journalist Fiamma Nirenstein was a member of the Italian Parliament (2008-2013) where she served as Vice President of the Committee on Foreign Affairs in the Chamber of Deputies, served in the Council of Europe in Strasbourg, and established and chaired the Committee for the Inquiry into Anti-Semitism. A founding member of the international Friends of Israel Initiative, she is the author of 13 books, including Israel Is Us (2009). She is a Fellow at the Jerusalem Center for Public Affairs.